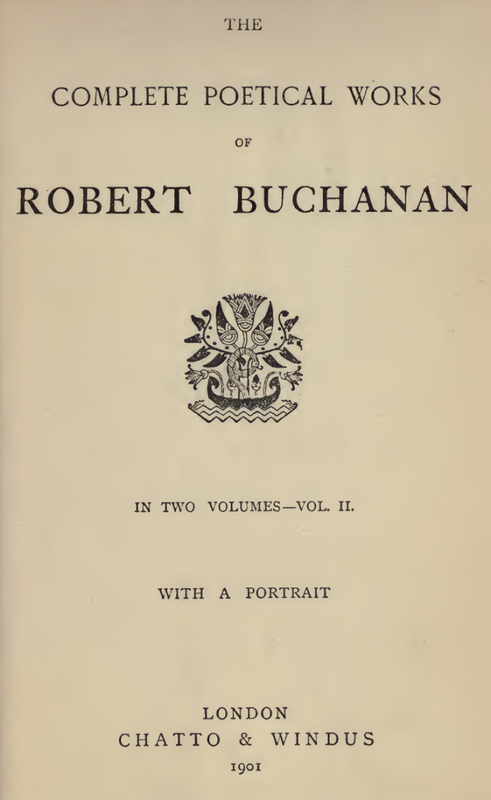 The Complete Poetical Works of Robert Buchanan. 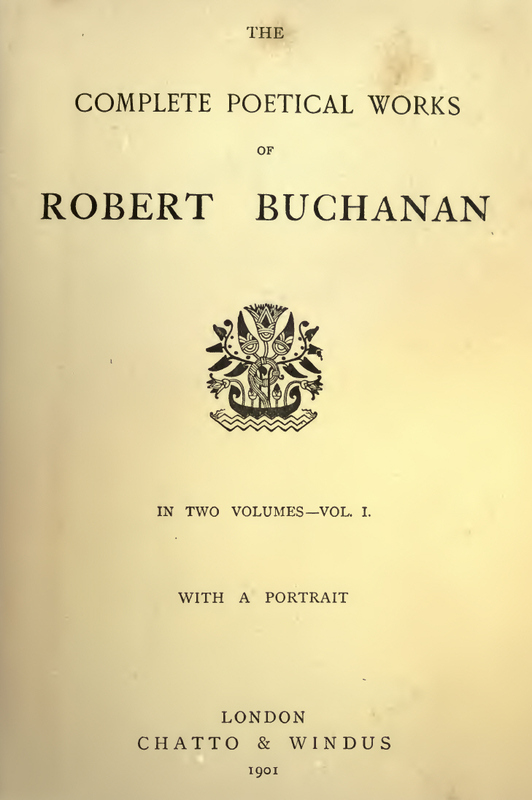 The two volume Complete Poetical Works of Robert Buchanan was published by Chatto & Windus in October, 1901, four months after the death of Robert Buchanan. 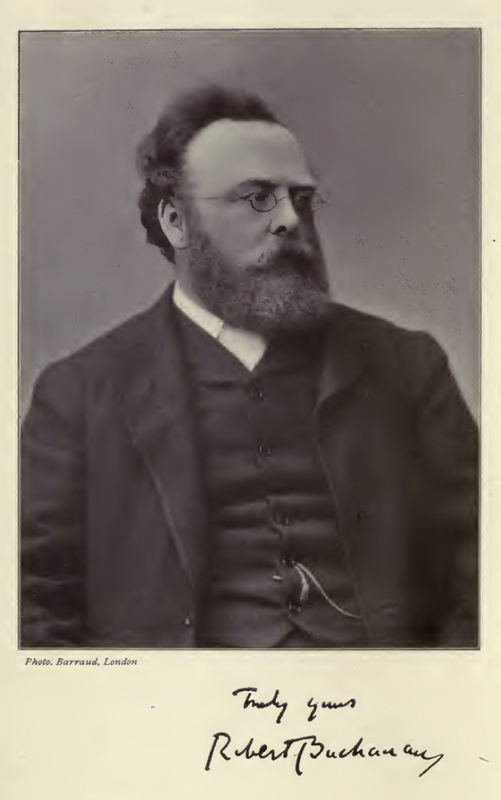 The first volume was a straightforward reprint of the 1884 Poetical Works. THE BALLAD OF MARY THE MOTHER. 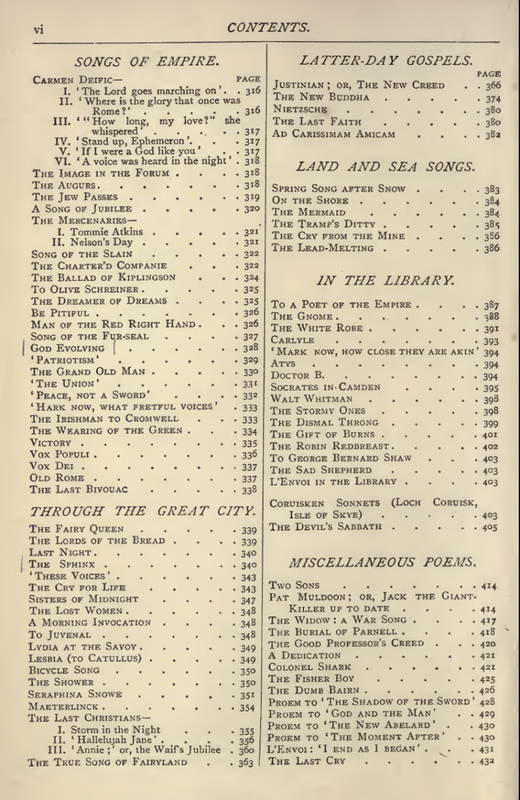 The New Rome was Buchanan’s final volume of poetry, published in December, 1898. 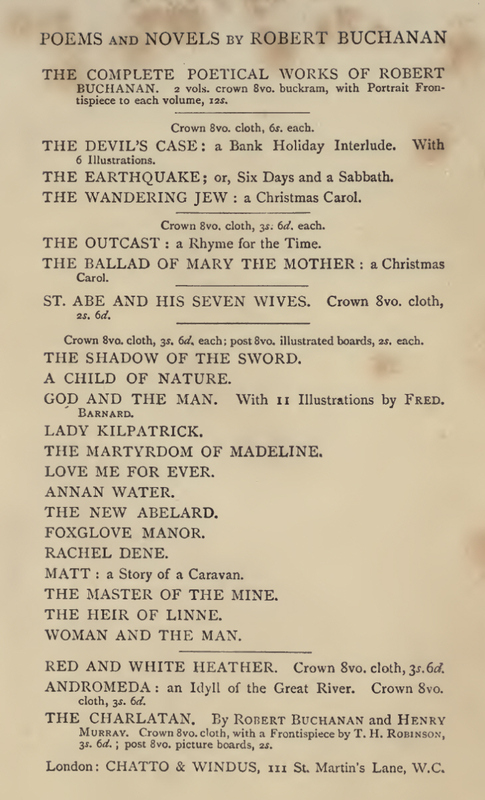 In the 1901 edition of The Complete Poetical Works of Robert Buchanan, ‘Pan At Hampton Court’ is not included since it was originally published as part of The Earthquake (1885), and the second poem in ‘The Last Christians’ - ‘I Saw on the Bridge of Sorrow’ (renamed ‘The Ballad of the Magdalen’ in the text) is also omitted, since it appears in its earlier incarnation as ‘Mary Magdalen’ from The City of Dream (1888). 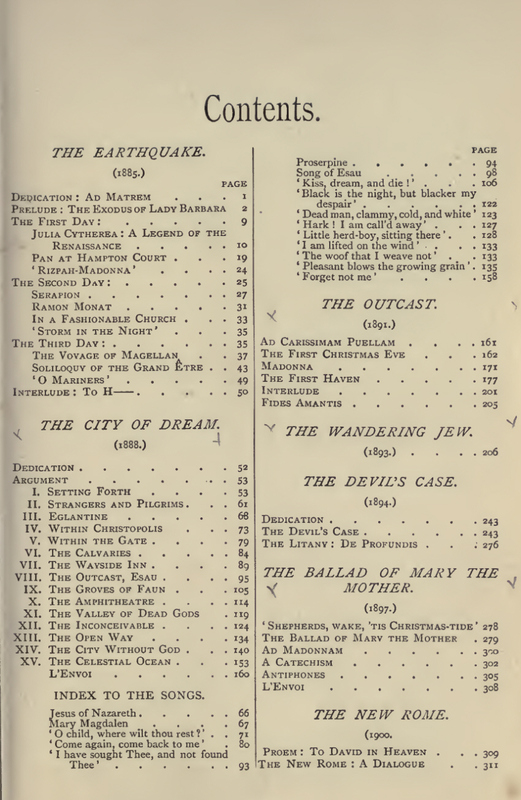 A section of ‘Miscellaneous Poems’ is also inserted between ‘The Devil’s Sabbath’ and ‘I End As I Began’. ‘Two Sons’ - from the 1874 Poetical Works, reprinted in Selected Poems (1882), which is the version used here. ‘Pat Muldoon; or, Jack The Giant-Killer Up To Date’ - according to several American newspapers, the poem was published in ‘Today of London’ some time before 25th November, 1899. According to Drummer Hodge: The Poetry of the Anglo-Boer War (1899-1902) by M. van Wyk Smith (Oxford: Clarendon Press, 1978), it was issued as a broadside by the International Arbitration League, but no date is given. PAT MULDOON; OR, JACK THE GIANT-KILLER UP TO DATE. That’s tinder to a woman or a child! ‘D’ye mind the time long past, when we met the beggars last? A devil’s imp—all mischief, never still! That ever hoped to dodge a cannon ball! And it’s me that will be there to strike ’em dumb! I’m a soger! Jack’s my name! like that other known to fame! We slapt him on the back, and cried, laughing, “Bravo, Jack! Came thronging all around us thick and fast! And that little imp of Cain was in it all! Like flocks of hungry wolves around a fold! As they popt their shaggy heads out one by one! And at last they made a dash—and we was done! Still standing up, though wounded by a ball! At a Giant wid a bushy beard—and missed! And that Ogre wid the shaggy beard and hair! Tuck’d Jack beneath his arm, and walked away! Till safe within our lines we breath’d once more. Yis, gobbled up and aten by the Boer! When I heard a loud laugh near, and a voice cried, “Pat, look ’ere! “Is it you, Jack, or your ghost? Sure we thought ye dead and lost! A prisoner in the keepin’ of the Boer! Not a bloody raging baste,” said Jack Molloy. He screech’d and swoon’d away—he was so skeered! And all the world seem’d far away and dumb! Ran through him, from the red wound in his side! A shape that stood and listen’d by his bed. Bent above him, and a tear fell on his cheek! Said something that he could not understand! Standing near him, blinking down upon the bed! And that Bloodybones was there at last to slay . . .
And he nodded in a friendly sort o'’way! And kept him like a young bird in a nest! Jack’s own age, too, and his very size and make! He had saved him—for the little Dutchman’s sake. . .
Where Jack was nurst through thim long summer hours! Lay sprawling its fat fingers through the flowers! In the lingo that he didn’t understand. And grunt and grin and nod at Master Jack! He’d laugh and pat him gintly on the back! As Jack did! Little Jack! till they sent him smiling back! Do I know it? Don’t I know it! I was there! It’s a noble foe you’ll find across the Say! Not an Ogre, or a ragin’ baste of prey! Do I know it? Don’t I know it! Sure I’m livin’ here to show it! THE WIDOW: A WAR SONG. ‘I know that you will always do your duty to your Sovereign and country, wherever that duty may lead you, and I pray God to protect you and bring you back safely home.’—THE QUEEN to her Soldiers. Stood listening, old and gray. The Widow knelt to pray. Pray’d still on bended knee. The Widow wrung her hands. Must cast the Sword aside! ‘Oh, Watchman, mark my sons once more! And wrung her hands again. The royal Widow rose her height.